September 29th is National Coffee Day! What an amazing opportunity to get your coffee on at some of the fabulous coffee shops we have here in central Indiana. I could go on and on about my favorite shops to pick up a cup of java, but there are too many to list and we’ve only got one day to enjoy some of the great deals I have listed below. First, let’s start with the good stuff: local shops. These are the best of the best, as well as some of my favorites. I’m all about supporting the local businesses! 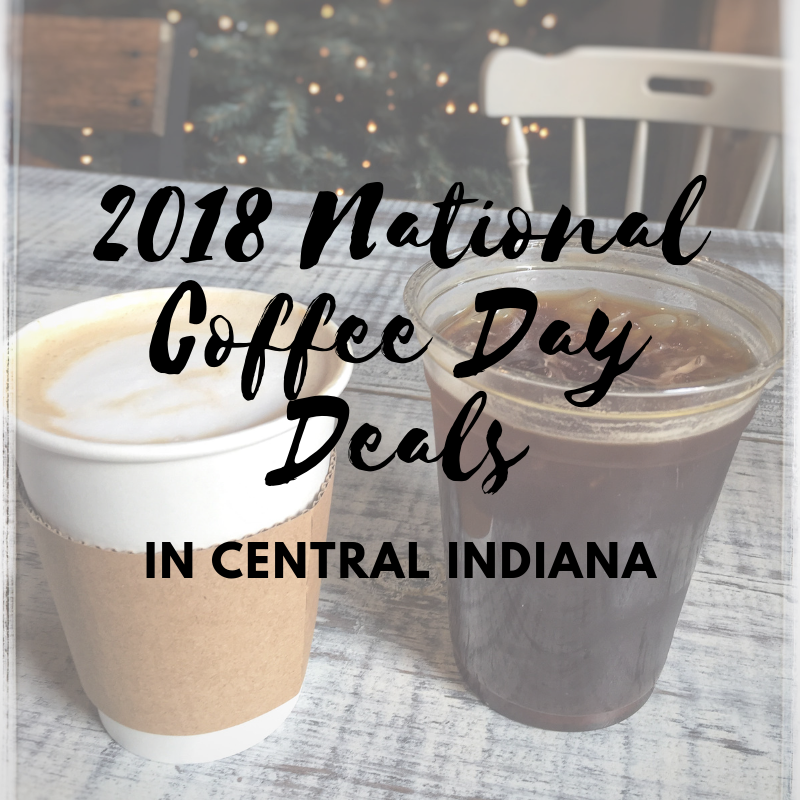 After some extensive searching, I found that no one has ever posted a list of local National Coffee Day deals for within central Indiana! Obviously, this problem had to be resolved. I spent some time emailing and calling some of the local coffee shops and below is a list of the shops I did get connected with. This list is evolving and will be updated as more deals are posted. Many businesses will not be listing their promotions until Friday evening so keep an eye out here and on your favorite shop’s social media pages. Bee Coffee Roasters Hive – buy a bag of fresh coffee, get a free cup of coffee. Indianapolis, IN. Brickhouse Coffee Co – $1.00 for a large brewed coffee and 50% off all of their seasonal beverages. Greenwood, IN. Calvin Fletcher’s Coffee Company – 10% off all bulk coffee & adding apple cider to their Fall lineup! Indianapolis, IN. Della Leva Espresso Bar – $0.50 off any drink and $2.00 off any of their three lunch sandwich options. Fishers, IN. Falls Perk Coffee House – will be serving a limited Fall menu including a Maple latte, a Toast Marshmallow Mocha and more! Pendleton, IN. Fisher’s Parks & Rec Department – hosting an International Coffee Day meet-up with free coffee for residents ages 50+ On Monday, Oct. 1st, from 7-9am at the Ambassador House. Fishers, IN. Jack’s Donuts of Muncie – Check Facebook for upcoming details. Muncie, IN. Jack’s Donuts of New Castle – check Facebook for free small coffee mention! New Castle, IN. Main Street Sweets Cafe – 15% off of all coffee drinks. Cambridge City, IN. Mile Square Coffee – Check Facebook for a mention special! – Indianapolis, IN. Noble Coffee & Tea Company, Ltd. – will be donating $1 from each bag of coffee sold to the Hamilton Humane Society. Noblesville, IN. Strange Brew – 10% off all coffees and 30% off the specialty drink. Check Facebook for more details! Greenwood, IN. Barnes & Nobles – free tall, hot or iced coffees at all locations. Cinnabon – free 12-ounce coffee. Corner Bakery – free hot coffee or cold brew with any purchase on Friday or Saturday. Dunkin Donuts – offering a BOGO freebie deal for all hot coffee drinks. Einstein Bros Bagels – a free cup of coffee of any purchase with any purchase of any food item. Krispy Kreme – free coffee of any size. Bonus: if you are a member (you can sign up free), download their app to also get a free donut that day! Various locations throughout Indiana. Love’s Travel Stop – $1.00 for a 24 oz hot beverage (coffee, tea, cappuccino, cocoa, etc.). That $1.00 will then be donated to Riley Hospital for Children! All Indiana locations participating. Pilot Flying J – a free cup of coffee Sept. 28th AND 29th if you download their app. Various locations throughout Indiana. Whole Foods – $1 off a 16-ounce pumpkin spice latte when using their app.